One of the best summer activities is hiking in the great outdoors. 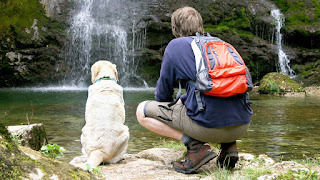 There are so many hiking options for you and your dog to enjoy and the long summer days offer the perfect opportunity. It is important though, when considering the appropriate trail, to take into consideration your dog’s ability, health and conditioning. Hikes at higher altitude can bother any dog and excessive heat combined with a steep hike can lead to heat stroke. Even young dogs can develop heat stroke given the right set of circumstances. Be prepared- Pack a Doggie Bag: include a leash, poo bags, first aid kit, vet information, a picture (in case the pet gets lost and plenty of food and water (with a collapsible bowl). Always bring treats along for your dog even if it is just a one hour hike. A dog's blood sugar can drop with excessive exercise and giving them a snack at the halfway point is recommended. Check the ground material--hot asphalt can burn through paw pads quickly and booties may be necessary. Also, steep rocks and plenty of foxtails can be a problem too. Keep your dog hydrated: A dog’s temperature rises faster than a person and adequate hydration is critical. You should consider avoiding the hottest part of the day and make sure you have plenty of fresh water with you. Do NOT allow your dog to drink from streams or ponds as they may contain giardia and bacteria which can make your pet sick. Keep your dog in sight: there are many potential dangers in the outdoors and the best way to protect your pet is by knowing your environment and to keep a watchful eye. Do not let them chew plants (especially wild mushrooms) and watch for other wildlife such as rattlesnakes that could attack/bite your pet. If an attack occurs or you believe your dog ingested something poisonous, seek immediate medical attention. Time is of the essence when it comes to a rattlesnake bite. Watch out for other dogs: just because your dog is friendly doesn't mean everyone else's dog is. You may be walking in an area where locals frequent regularly with their dog's offleash. As tempting as it is to let you dog run wild, it is highly recommended to keep your dog on an extended leash instead. Check your dog during the hike: look for wounds, paw cuts/cracks, and ticks on your dog during your hike. If a tick is found, remove it immediately to avoid exposure to Lyme disease. Lyme disease is a tick borne infectious disease causing tiredness, fever, joint pain and loss of appetite and can be contracted within hours. Keep your dog cool after the hike: even young dogs can develop heat exhaustion quickly. Too much hiking in one day with high altitude can cause them to become extremely fatigued. Contact an emergency vet if you notice your dog has suddenly become lethargic, drooling, red gums, excessive panting. Hyperthermia is common and can become an emergency.